One of the top news stories this week is the rising number of flu cases. Minnesota Department of Health officials said there were 111 new hospitalizations in the state last week. So far this week, there are 96 and counting. The latest figures from the Centers for Disease Control and Prevention show widespread flu cases throughout the United States, as well. 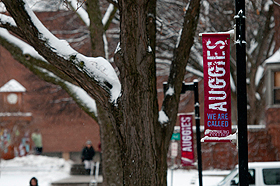 The health and safety of the Augsburg Community is a top priority, so College staff are monitoring federal and state health resources and communicating with students, faculty, and staff about flu season. "Each member of our community—students, faculty, and staff—has a role to play in limiting the impact of flu on campus," said Ann Garvey, vice president of Student Affairs. "With students returning to campus and classes starting up again for all our programs, now is the time to remind Auggies how to stay healthy." – Wash your hands often with soap and water or an alcohol-based hand rub. Be sure to disinfect your hands before eating and after using the washroom. Alcohol-based hand rub stations are located in many high-traffic areas on campus. – Avoid touching your eyes, nose, or mouth. Germs spread this way. – Try to avoid close contact with sick people. Practice good health habits. Get plenty of sleep and exercise, manage your stress, drink plenty of fluids, and eat healthy food. – Cover your nose and mouth with a tissue when you cough or sneeze. Throw the tissue in the trash after you use it. – If you are sick with flu-like illness, stay home for at least 24 hours after your fever is gone without the use of fever-reducing medicine. – If you have an Influenza-Like-Illness (ILI), defined as fever equal to or greater than 100.0 plus a cough or sore throat, the Centers for Disease Control (CDC) recommends you self-isolate until at least 24 hours after you are free of a fever of greater than 100 degrees F without the use of fever-reducing medications. Self-isolation means staying away from people except to get medical care or necessities. You should avoid large group gatherings including classes, sporting events and public forms of transportation. For most cases this period of isolation would last from 3 to 5 days. The full list of flu symptoms is available from flu.gov. – Call the Dean of Students Office, 612-330-1160 and we will help notify your instructors. Professors are aware of these CDC recommendations and will do their best to be flexible with your missing classes. If you live on campus and have an Influenza-Like-Illness, you should talk with your parents and family about going home, if you can, while you recuperate. "We encourage students with flu to stay home and, if they live on campus, to go home to recuperate," Garvey said. "We know this isn't possible for all our students. But for those who can, it's a smart move because their families will be able to provide a high level of care and monitoring." – If your roommate is not able to self-isolate by going to his/her permanent home, stay with a friend in their room. Or, if you live close by, consider going home for a few days and commuting to class. If you are dealing with a situation and need assistance, please call the Dean of Students Office at 612-330-1160. For the most up-to-date information on flu, visit flu.gov, or call 1-800-CDC-INFO (232-4636). Learn more about preventive actions to stop the spread of germs.